St. Mary’s Software Engineering senior Hudson McAshan and Engineering Science senior Kiernan Akers want to prevent injury to babies from being accidentally left in hot vehicles. 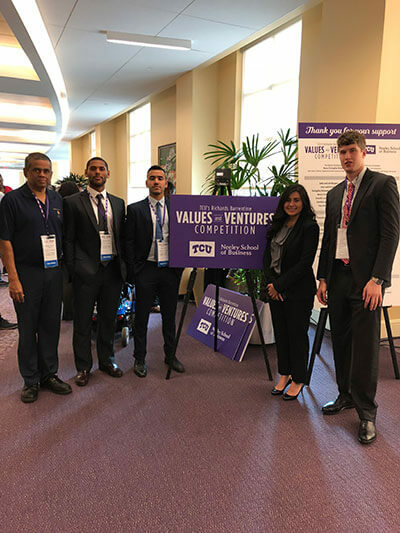 Their concept for a baby car seat design, which includes sensors monitoring temperature and distance from users, earned them the Marjorie and James Sly Award for Innovation — and $2,500 — at Texas Christian University’s 2018 Richards Barrentine Values and Ventures Competition on April 7. Along with help from Finance and Risk Management senior Andres Valle and Marketing junior Kimberly Rodriguez, the team showcased McAshan and Akers’ St. Mary’s senior design project. “Our idea for the project was to make the safety of the baby the primary focus while also making it as simple as possible for users,” McAshan said. The idea is if users linked to the baby car seat sensors via their phones were to move too far away from the seat, or if the temperature in their vehicles were to rise too high, they would receive an alert. McAshan said Mathew Joseph, Ph.D., the Emil C.E. Jurica Distinguished Professor of Marketing, helped the team develop this idea and encouraged them to sign up for competition.